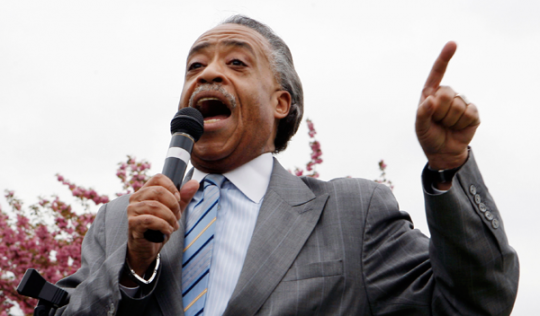 MSNBC’s Al Sharpton is reeling in debt and back taxes. Sharpton has his own primetime talk show on liberal network MSNBC, a platform he used to drive the Trayvon Martin shooting story that rocked the nation and led to the arrest of Democratic neighborhood watchman George Zimmerman. In August 2011, Sharpton took over the 6 p.m. slot from Keith Olbermann, who earned more than $4 million per year working in the same slot at the network. Sharpton also drew a $240,000 salary from his nonprofit group, National Action Network, in 2011 even as the group racked up nearly $1 million in unpaid federal payroll taxes, interest, and penalties. NAN has dealt with major finance issues in the last few years. The nonprofit raised $3 million in 2010, and paid off its state back taxes in 2011, but still owed $883,000 in unpaid federal payroll taxes in December. The group also owed more than $200,000 in loans to one of Sharpton’s for-profit enterprises. Sharpton, who has endorsed President Barack Obama’s calls for taxing the rich, has his own tax issues. He owed the IRS $2.6 million in income taxes in December 2011, as well as almost $900,000 in New York state taxes. Sharpton financed his presidential run, in part, by borrowing large sums of money from his struggling nonprofit. Sharpton borrowed more than $181,000 from NAN—money that is now supposed to be refunded. Sharpton also loaned $145,000 to the campaign to finance a fundraising push. His largest creditor is the federal government; the campaign owes the Federal Elections Commission and the U.S. Treasury Department more than $225,000. Sharpton could not capitalize on his national reputation as a rabble-rouser in the 2004 Democratic primary, losing out to Sen. John Kerry (D., Mass.). But he did make waves in the race, slamming then-frontrunner Howard Dean for not having enough minorities on his campaign—a charge that has also dogged the Obama campaign—during an Iowa debate. Sharpton skipped out on debts big and small. In addition to the six figure sums he borrowed from his nonprofit and leveraged from campaign consultants, he has not paid a $0.33 charge to a group called Xpedite, as well as a $2.50 ATM fee to Amalgamated Bank. Sharpton’s presidential committee owed more than $900,000 to creditors late in 2011, according to Politico, after paying down the $208,000 in civil penalties the campaign owed the FEC for "failing to report accurately all receipts and expenditures, receiving excessive and prohibited in-kind contributions and accepting impermissible corporate contributions," according to the FEC. The campaign has established a payment schedule to address the fines for campaign violations and other federal charges, according to the FEC. "Now that the civil penalties have been satisfied, the campaign is contacting vendors to construct a debt resolution plan that must be submitted to the FEC for approval," spokeswoman Rachel Noerdlinger told Politico in November. "While Rev. Sharpton, as candidate, helped to raise the money to resolve the civil penalties, the additional debt will be reviewed by the campaign and remedied in accordance to FEC’s rules and regulations." Calls to Sharpton’s creditors have not been returned. This entry was posted in National Security and tagged Al Sharpton, Democratic Donors, FEC, Media. Bookmark the permalink.